More than 100 climate change activists have been arrested for blocking roads in central London amid protests which brought the capital to a standstill. 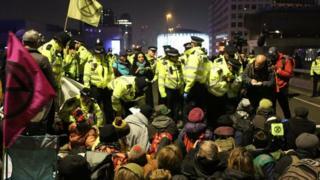 A second day of disruption is expected as Extinction Rebellion campaigners camped overnight at Waterloo Bridge, Parliament Square and Oxford Circus. The Met said 113 people had been arrested as of 06:00 on Tuesday. Most were detained on suspicion of public order offences while five people were held on suspicion of criminal damage at Shell’s HQ.